Potty training second time around is said to be easier as you know what to expect. 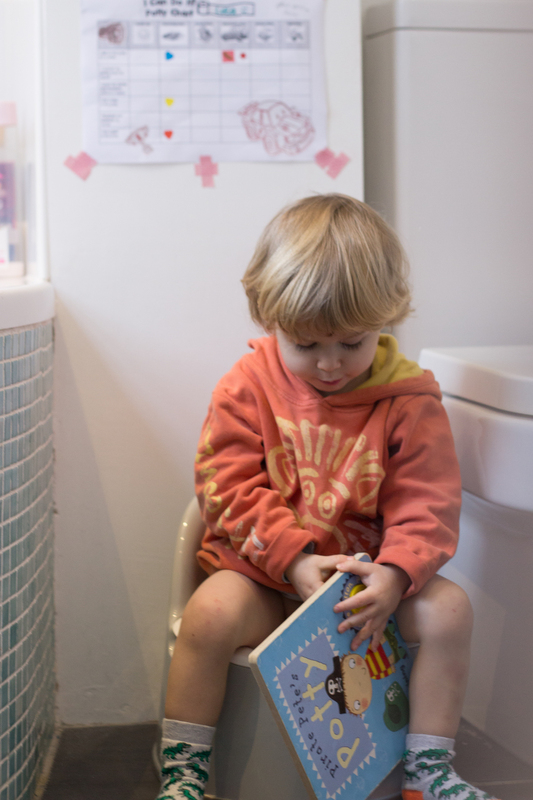 You’ve learnt what helps or hinders little ones in their attempts to use the potty. You understand what you need as a parent to remain patient through the unavoidable accidents and clean ups. You know it doesn’t pay to push potty training too soon. 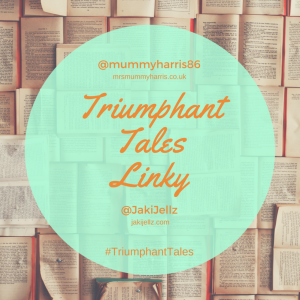 It turns out potty training second time around, despite any previous successes, is not simply a case of repeating what you did before! , a book that was given to us when we first started potty training with Euan 4 years ago. When OXO Tot UK offered to send us one of their new Potty Chairs Luca was excited to try it out (or unwrap the giant box it came in at least). It made the perfect seat for snacking and he thought it was hilarious when his big brother removed the potty bowl to wear on his head (it never gets old!). Luca was more inclined to use it as a racing track for his Lightening McQueen in the early days than what it was intended for. The OXO Tot potty chair is a stylish, simple design that’s easy to clean and has a non-slip base. It’s really comfortable for little legs as the squat position is not too low. The back support, which includes a carry handle, is helpful when sat for some time; afterall encouraging wees and poos can take a while. I like that however long Luca sits for bare bottomed he is never left with pressure marks on his bottom or legs. We had our potty chair in the bathroom long before Luca was really ready to use it and encouraged his curiosity about what it was for with no expectation of him using it. We find this kind of gentle exposure a helpful introduction to it’s later use. A few months later Luca was still showing little interest in using his potty. I sent an apologetic email to OXO Tot explaining the delay with our review. They sent an understanding reply back appreciating toddlers learn at their own pace not ours. The summer holidays took an unexpected turn when my Mum died so I was relieved we weren’t halfway through the transition from nappies to pants. Luca had at least been starting to reach for his Pirate Pete’s potty book more often at bedtime. Children love repetition in stories or recounting their favourite phrases from a story. Books are great openers for conversations about all sorts of aspects of their day. We’d pretend to be puzzled about the potty chair and ask Luca ”What is that for again?” and he would call back triumphantly ‘‘for doing wees and poos in”. We’d feign confusion sometimes and ask ”Do we do wees and poos on the carpet?” and he’d give a hearty laugh and say ”Nooooooo, in the potty then flush it down the toilet”. The potty training experience with our both our boys has been a slow and gentle process that begins with the confidence to play nappy free. Playing with pants and having a say in which ones they wear (given how potty learning occurs at an age where children are developing their independence) helps children to feel in charge. 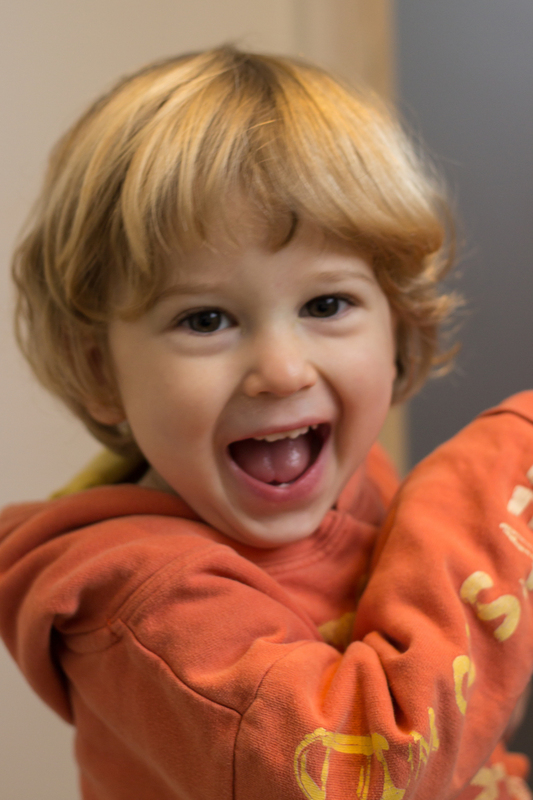 Our primary aim with Luca has been to help him listen to his body’s signals and learn patterns of response. He really dislikes being asked to try for a wee when he knows there isn’t one coming! Luca is so independent and fiercely determined. He furrows his brow as he struggles into his pants, often with both legs through one hole, and brushes off help with a fierce scowl ‘‘My do it myself”. Now that he understands he can control his need for the toilet he’s keen to wear ”big boy pants like Euan”. Luca loves his older brother so much and it definitely helps to have another person cheering him on. When Euan was learning to be potty free he was very reluctant to wear pants after a few early incidents wetting them. I found putting pants on over his nappy was a good way to transition towards the idea of wearing them again without a nappy. 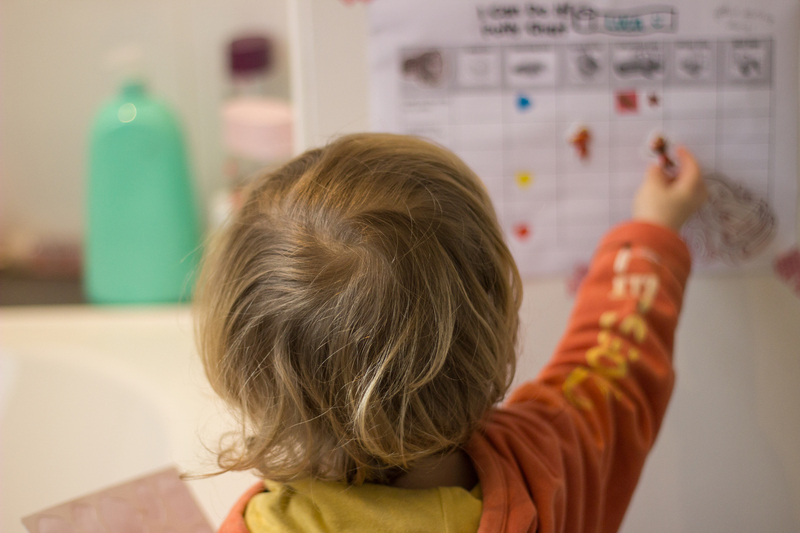 I made a sticker chart for Euan first time around to encourage him with all the actions involved with toileting. It reminded us to encourage him at various points throughout the day. 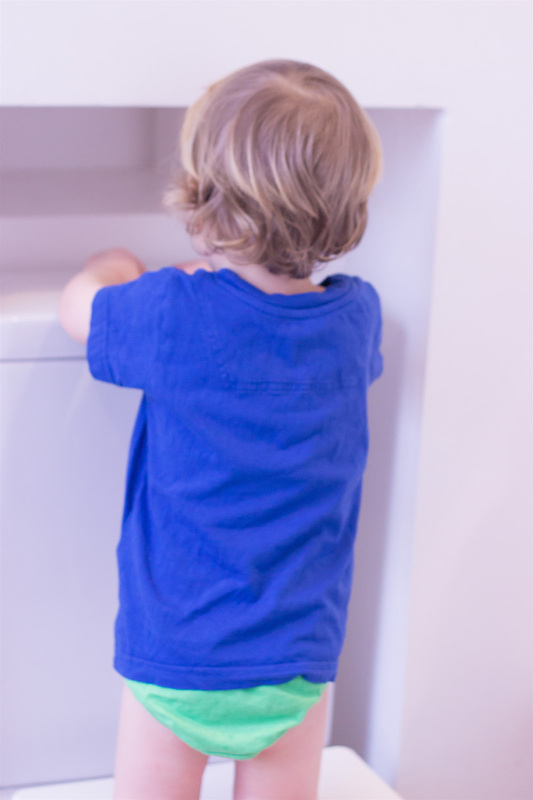 Toddler toileting can be so unpredictable with hour long gaps or several wees in quick success. Making a chart wasn’t about rewarding his efforts but simply a way for Euan to feel ownership of the process. It was a visual reminder for him of what steps were involved with toilet trips. Euan choose a selection of stickers to mark his potty chart including some really special bug stickers for completing steps he felt a greater sense of achievement for like doing a poo in the potty (if you try this method be prepared for your child to think everything is worthy of their best stickers). I printed the chart again for Luca and he chose a sticker for each action completed. In the early days of potty use this might be as simple as sitting down to try or pushing trousers down by himself. Later on it’s the triumph of a well timed wee or poo and then flushing it away. 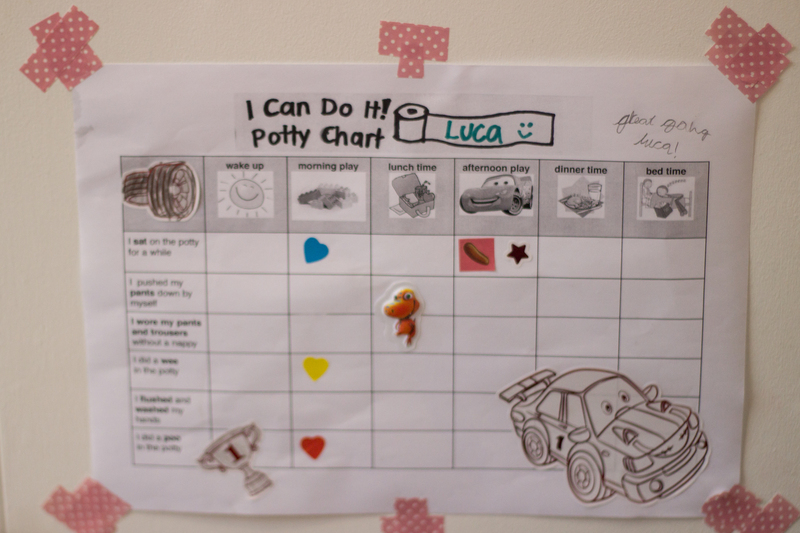 I’ve attached a copy of Luca’s Potty chart PDF – nipitinthebud.co.uk for anyone who would find it helpful. Luca has been enjoying marking his potty progress in this way too. He’s vocalising when he has a wee or poo coming and if he has a nappy on is given the option to take it off. We’re having longer periods of time playing without a nappy on and keep the potty within reach wherever we’re playing . You have to be prepared for accidents as there’s not always much time between ”a wee wee is coming” and getting pants down and a botty parked! I really believe that children do things best when it’s at their pace and they feel in charge. The difficulty with learning to use a potty is that most children would happily stick with what they’re accustomed to if we didn’t encourage it. So I find it’s a fine balance between watching your child for signs that they understand what wees and poos are and where they go and not forcing it too soon. Although my boys have come out of their nappies later than some children (around 3 years old) when they do it’s taken just a couple of weeks once we’ve bitten the bullet with pants only. The OXO Tot potty chair is a great product. 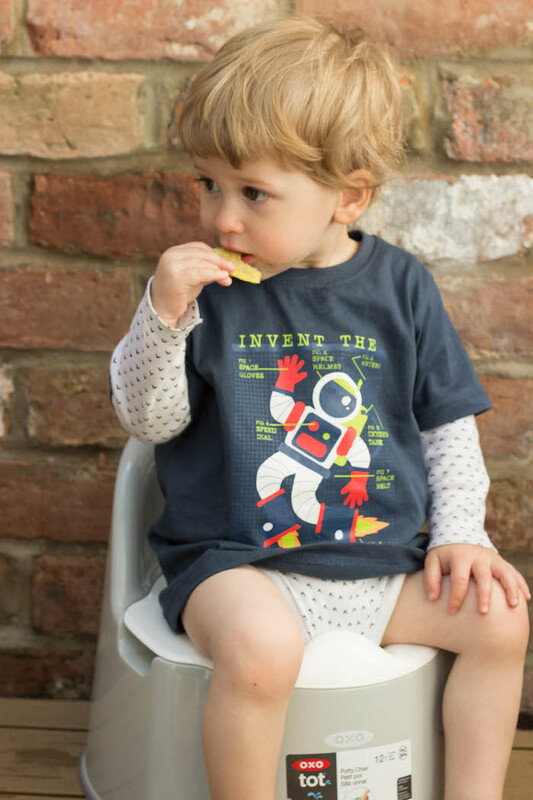 It’s more expensive than smaller, cheaper brands at £26 and if you see potty learning as a short term activity to get your child out of nappies you may feel it’s a lot to pay for a potty. However as many children continue to a use a potty long after they’re out of nappies I think it’s well worth the investment, especially if you might use it for further siblings. I remember Euan was scared of falling into the toilet for a long time after he potty trained (OXO Tot have a solution for that now with their sit right potty trainer seat). The potty remained a permanent feature in our bathroom for a long time after nappies were no longer needed. The OXO Tot potty chair is easy to carry from room to room and I’d have no issue with taking it to someone else’s house if they didn’t have a potty. If children feel scared to use the bathroom accidents happen so keeping a shopping bag at the ready to transport our potty chair is easier than preparing for a clean up job. Our potty chair still looks new so it’s nice to know we can pass it on to another family when we no longer need it next year. Disclosure: I was sent the OXO Tot potty chair for the purposes of this review. I was not required to write a positive review and any opinions expressed are my own. Great review. And it is so interesting to hear about others experiences of potty training. My LO is still not showing any inclination at 3 yrs old. We’ve downloaded your chart and will give that a try. Thank you. Hi Rose, thanks for commenting, it’s always nice to know if a post has been read and been useful to someone. You’re the best expert on your little one’s readiness. I really believe that when they’re not pushed and can do things in their own time they just suddenly get it. All the best with whatever comes next for you. I must admit potty training wasn’t a favourite phase for me – this potty chair looks great though. I think Oxo Tot as a brand are great generally though. I agree Collette, their designs are so well thought out.